Papillon resonates with the themes of hope and self-discovery found in classic escape films. In Papillon, two very different men, safecracker Henri "Papillon" Charrière (Charlie Hunnam) and currency forger Louis Dega (Rami Malek), form a bond to find a way off their remote island prison. The two friends' insatiable desire to be free enables them to face unthinkable hardships as they hatch new plans to accomplish the impossible. But their story "is about much more than trying to escape Devil's Island," says Michael Noer. "It's about trying to escape yourself and your past. For me, that's the true appeal of Papillon." Like the butterfly referenced in the title, each man must discard the person he was to find a new identity and a new sense of hope. We look at other classic films of escape to see the how they and Papillon reveal much more of what makes us free than what imprisons us. John Sturges' 1963 The Great Escape recounts a true story of man's need to be free at all costs, a drive equally apparent in Papillon . During the war, Australian journalist Paul Brickhill was a prisoner of war at Stalag Luft II where he assisted in the escape of 76 POWs in 1944. At once inspiring and tragic-73 were recaptured and 50 were executed-the event became the subject of his book The Great Escape. Writer/director John Sturges, who'd read an excerpt of the book in	Reader's Digest, immediately saw its potential as a film. "It was the perfect embodiment of why our side won," Sturges explains. "With no arbitrary rules, they [the prisoners] formulated an organization which eventually clobbered the German machine." It would take more than a decade and the box-office success of his Western The Magnificent Seven to gain Sturges the clout to realize his vision. Shot in Germany with a large ensemble that included American movie stars like Steve McQueen and James Garner and British thespians like James Donald and Richard Attenborough, the film opened to great success, but less than stellar reviews. Since its release, however, the film has only grown more popular. 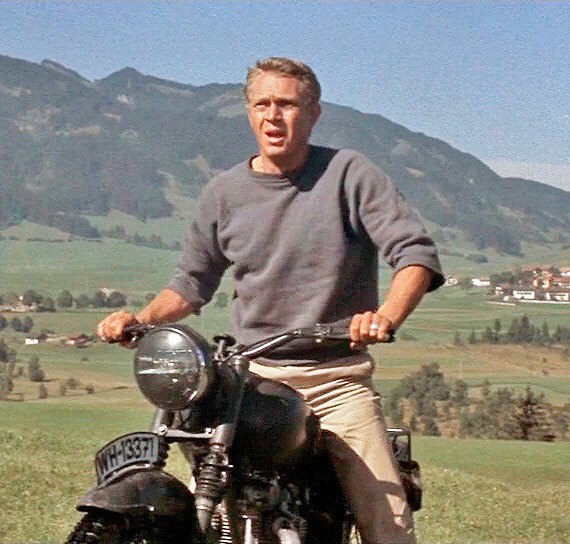 Steve McQueen's famous motorcycle jump over a wooden border fence is now considered a classic movie stunt. Elmer Bernstein's score has gone on to become the unofficial anthem for the British soccer team. In a 2006 British poll, it was voted third (after It's a Wonderful Life and	The Wizard of Oz) as the film families would most want to watch together at Christmas. Like Papillon and Dega, the characters in Frank Darabont's	The Shawshank Redemption refuse to give up hope, no matter what happens. Based on Stephen King's novella,	Rita Hayworth and Shawshank Redemption, Darabont's 1994 film has become one of cinema's most beloved fables of hope. Having established a relationship with the famous novelist early on by adapting one of his lesser-known stories for a short film, Darabont was able to secure the film rights for Shawshank for only $5,000. In truth, King had little faith in its cinematic potential, exclaiming there's "no chance they're going to make a movie out of this puppy." 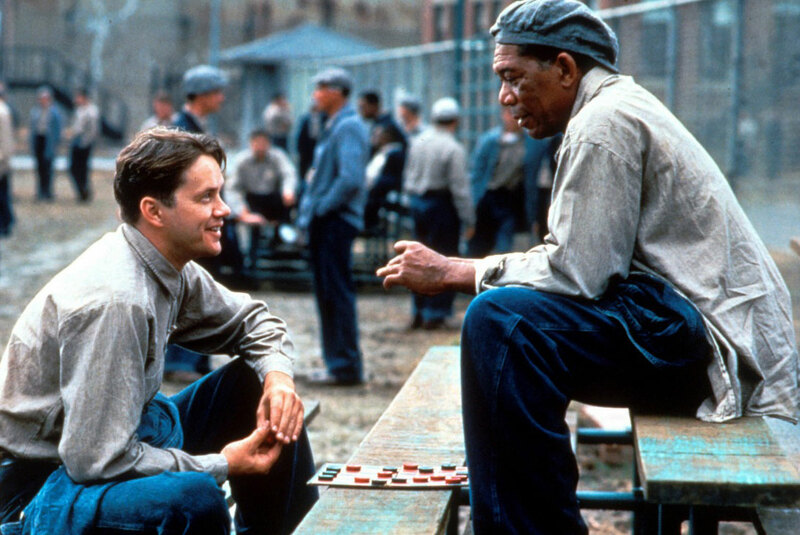 In the film, banker Andy Dufresne (Tim Robbins), doing time for a crime he never committed, befriends Red (Morgan Freeman), an inmate who readily admits his guilt. Over twenty years, the two build an enduring friendship that allows Andy to escape the injustice the world has done him. While the film received critical acclaim and was nominated for seven Academy Awards, it never took off at the box office. But like Andy, the film refused to give up. After being released on home video and TV, Shawshank became a modern classic. Recently it rose to become the highest-rated movie on IMDb. Robbins believes his film's message that "There is redemption in holding on to your dream" speaks to why people love it. For film critic Will Leitch, Andy is a modern-day everyman: "Our daily struggles aren't nearly as overpowering as his, but he still chooses to live, to survive - that feeling of needing to live that's universal, and timeless." As with Papillon, Escape from Alcatraz's tale of ingenuity and action in finding a way off an island prison feels all the more thrilling for being based on a true story. 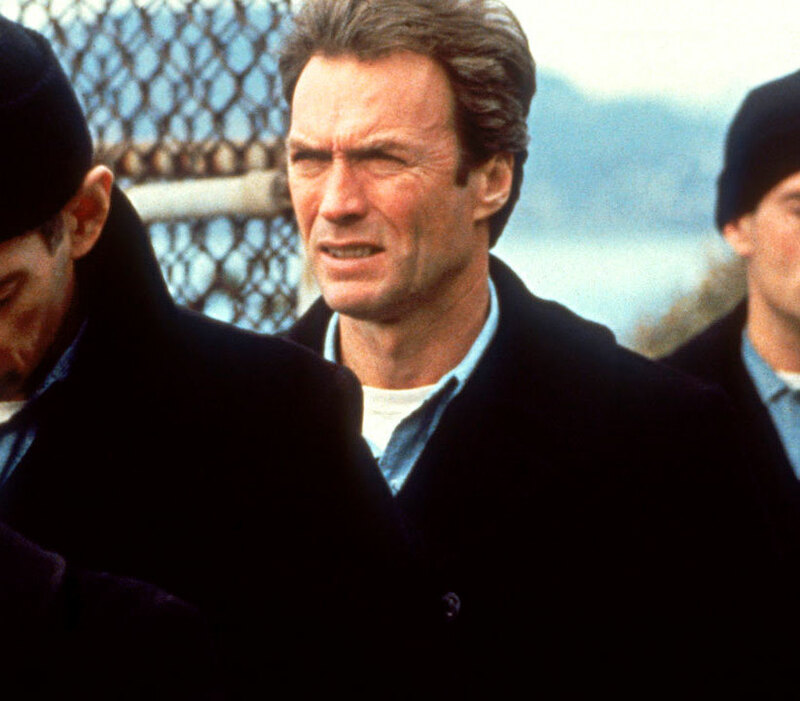 After having made such high-octane action films like Dirty Harry andCoogan's Bluff, director Don Siegel and star Clint Eastwood turned to dramatizing a real-life breakout for their fifth and final film	Escape from Alcatraz. Adapted from J. Campbell Bruce's book, the film recounts how Frank Lee Morris (Eastwood) and the brothers John and Clarence Anglin (Fred Ward and Jack Thibeau) escaped from Alcatraz in 1962-a year before Attorney General Robert Kennedy shut the island prison down. Most of the story follows a well-documented case. "We know from other people inside how it was all planned, you can pretty well retrace the whole story," explains Eastwood. "What happened to them when they got off the island, of course, nobody knows." Whether they survived or were drowned in the San Francisco Bay remains a mystery to this day. In preparing for the role, Eastwood called Jack LaLanne, who in 1955 had swum the distance from Alcatraz to Fisherman's Wharf in handcuffs, to see how it could be done. For Prison Movies: Cinema Behind Bars' Kevin Kehrwald,	Escape From Alcatraz- which was released just weeks before Jimmy Carter's famous "malaise" speech about America's "crisis of confidence"-speaks to the power of action. In The New York Times, Vincent Canby wrote, "What Mr. Siegel has made is fiction, a first&dash;rate action movie that is about the need and the decision to take action, as well as the action itself." 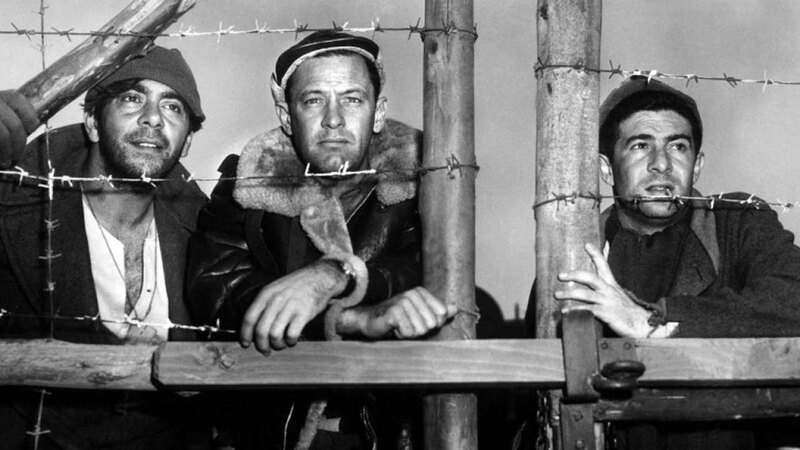 In a world of unrelenting routine, the characters of both Papillon and Stalag 17 do the unexpected, showing kindness to people they once despised and courage where there was only fear. Billy Wilder's	Stalag 17, a black comedy about escaping from a German prison camp, was, like its protagonist, the most unlikely of success stories. When Donald Bevan and Edmund Trzcinski's hit comedy about the crazy goings-on in a POW camp-based on their real experiences as prisoners-was staged in 1950, few thought the audiences would find this war story funny. But Wilder immediately saw what made it comical, telling his cowriter Edwin Blum that the reason he wanted to adapt it into a film was simple-"guys in underwear," by which he meant the story's freewheeling depiction of men on their own. When he asked William Holden to catch a performance in New York, the actor unfortunately didn't share Wilder's vision. He walked out before the first act was over. Wilder and Blum had to beef up the story and Holden's character, J. J. Sefton to get the actor to sign up. What Holden-and audiences-loved was Sefton's gradual transformation from a selfish, cynical antihero to the man who ultimately exposes an informer and helps an important prisoner escape. The New York Times' Bosley Crowther singled out this transformation as Wilder's "major achievement," in making Sefton a character with "nerve, ingenuity, and certain valor." Holden won an Academy Award for Best Actor and Wilder was nominated for Best Director. Years later, Wilder named Stalag 17 as "one of my favorites," especially singling out Sefton's final cynical declaration of love made just as he's about to escape through the tunnel: "If I ever see any of you mugs again, let's just pretend that we don't know each other." 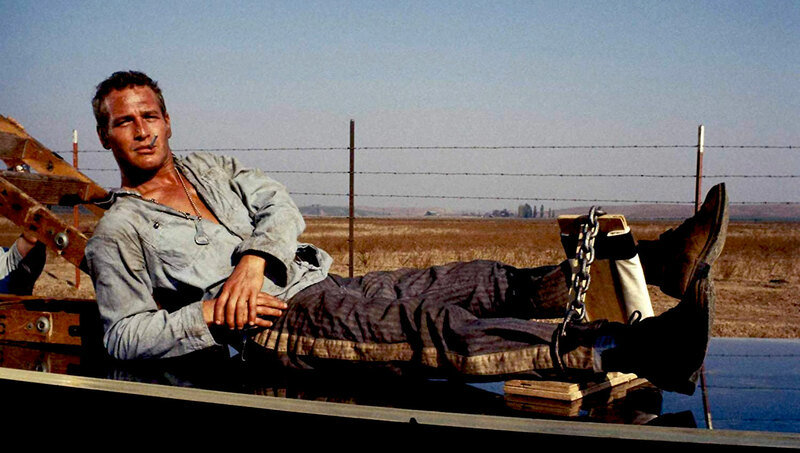 In Papillon and Cool Hand Luke, the hero, while a criminal, is also a man who refuses to give into authority, a man whose defiance defines him. In 1966, counterfeiter and safecracker Donn Pearce made his short life of crime pay when he sold his novel	Cool Hand Luke to Warner Brothers and then got hired to write the screenplay with Frank Pierson. Loosely based on his experience serving time in the Florida Department of Corrections for burglary, the film tells the story of a drifter Luke Jackson (Paul Newman). After being convicted to two years hard labor for a drunken night of vandalism, Luke is sent to work on a chain gang. Refusing to acknowledge either the authority of the overbearing warden (Strother Martin) or the prisoners' hierarchy, overseen by Dragline (George Kennedy), Luke continues to follow his own path, which is mainly taken up with finding new ways to escape. The film became a box-office smash, with Newman receiving an Academy Award nomination for Best Actor and Kennedy winning Best Supporting Actor. When it was released, the film celebrated the anti-authoritarianism that would that would define the emerging sixties counter culture. "With his every attempt at escape, the prison population celebrate his freedom," explains film writer Catherine Pearson. In 2003, the AFI placed Luke as 30 in the list of 100 "Greatest Heroes."